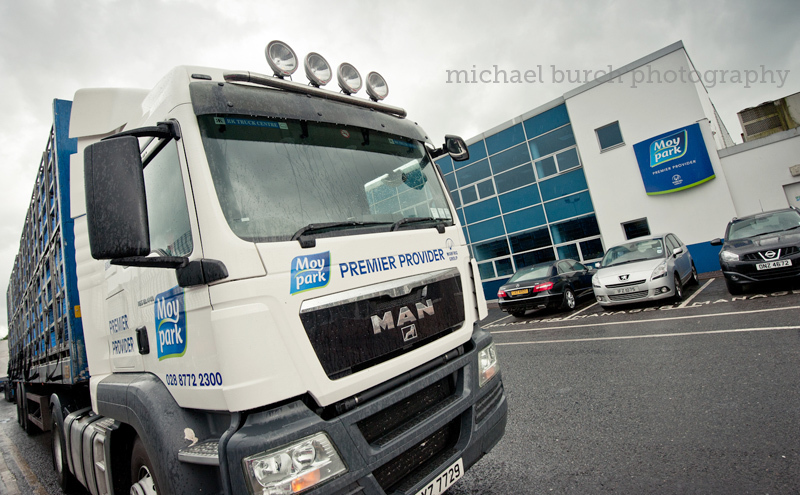 This is a very quick post about some photos taken near Dungannon to be used by Moy Park as part of the imagery in their corporate responsibility report. 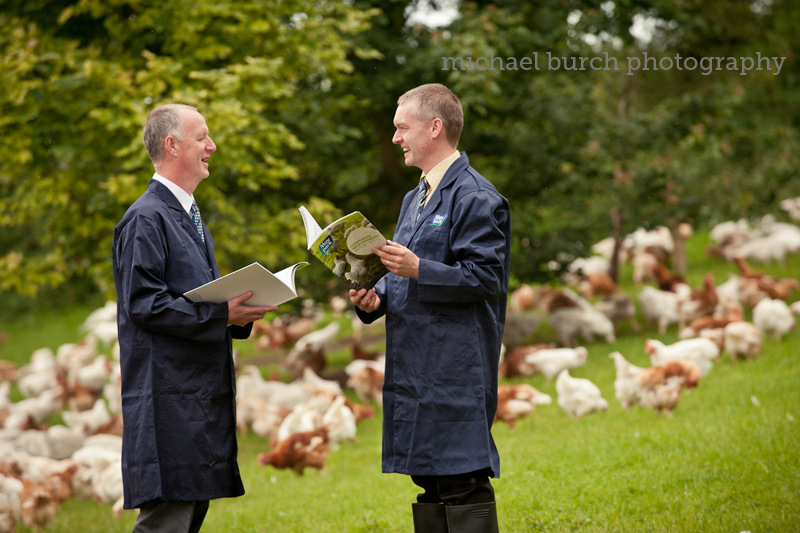 I was told to meet my contact at the Dungannon Moy Park site where we headed by car for about 15 minutes into the countryside to the farm we would be taking the photos at. 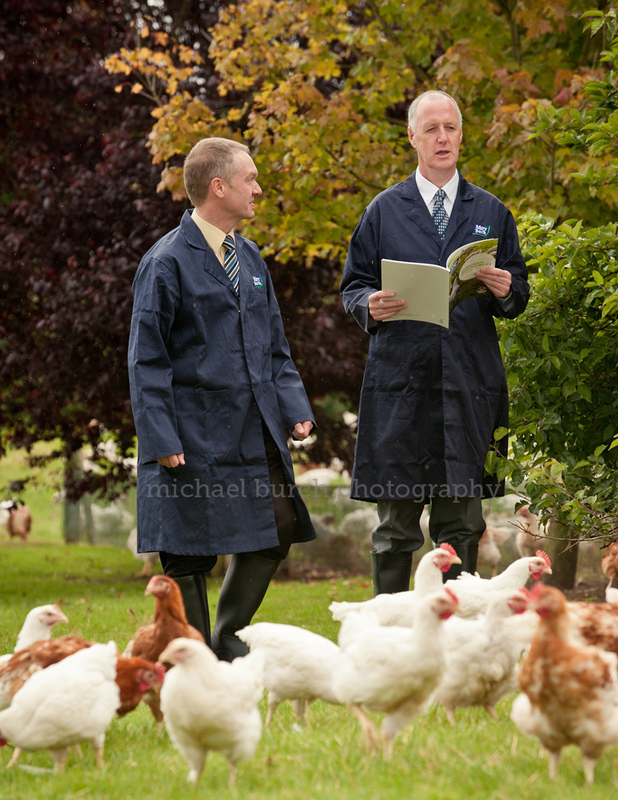 The brief for this job was to photograph the two Moy Park directors visiting the chicken growing farm and photograph them walking around with the chickens in the shots. Some of the photos were to be staged and some candid shots of them talking to each other ignoring the camera. As you can see in the photo above it wasn’t a bad day at all when we arrived at the farm, although the forecast wasn’t great and it was threatening to rain all the time. 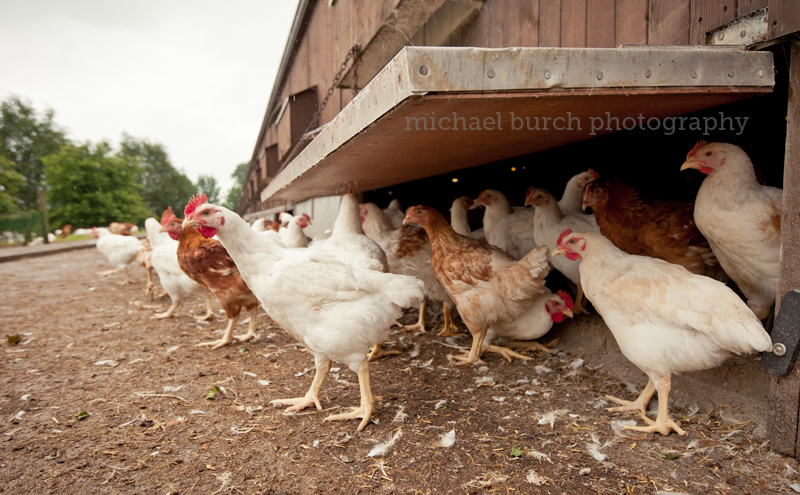 For these images I used a long lens and natural light. 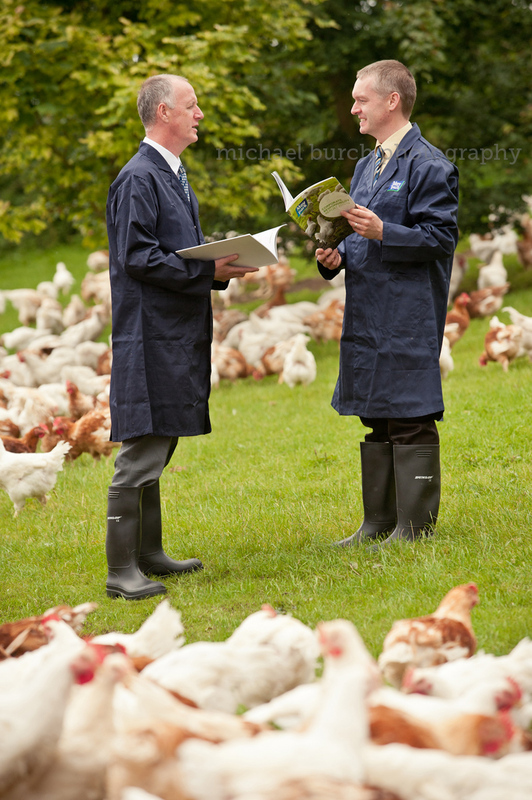 There was no need to complicate these images with using flash and the nature of the photos meant that I would need to move the two men around and have them walk around on their own so I wouldn’t have time to set up light stands e.t.c. As you can see in the examples above I needed to get a selection of different photos, both portrait and landscape orientation so they could be used in various different leaflets, magazines and websites. 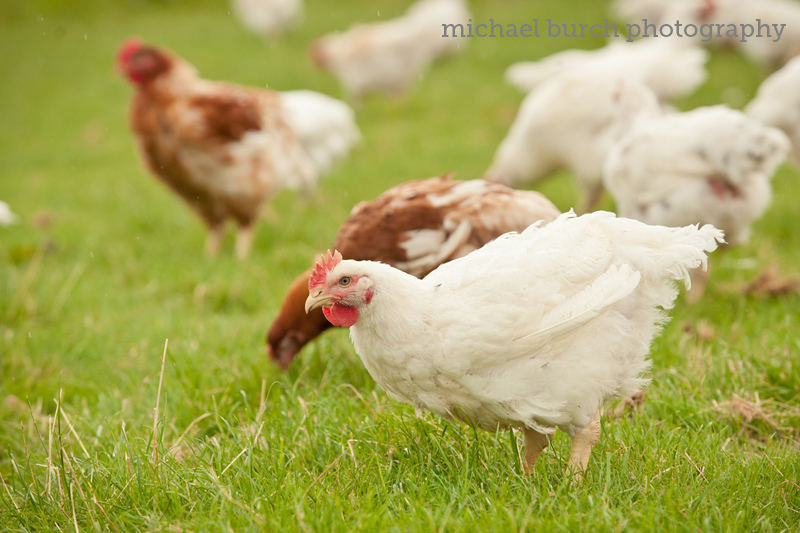 The second part of the brief was to get some photos of the chickens roaming around the fields which surround the chicken houses. These were more to have as a collection of images that could be used in the future for various different purposes. 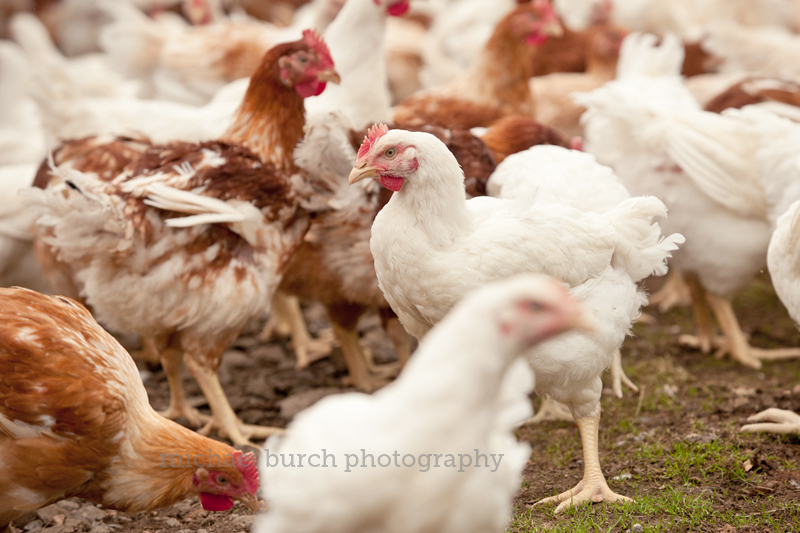 Luckily I managed to get all the people photographs completed before it started to rain, leaving me a few minutes to run around trying to photograph the chickens before they too heading back inside the barn for shelter. Again for these shots I used a mixture of the long lens and a wide angle to get a variety of different shots so the client had a good selection. The final part of the brief was to photograph the Dungannon site once we got back. Again this was just to have on file as part of a collection of the different sites around the country. Unfortunately the weather was pretty miserable by the time we got back but I still managed to get a quick shot of a Moy Park truck parked outside the front with plenty of branding on it and the factory behind. Hopefully next time I’m back in Dungannon the weather will be a little nicer and I can get a sunny photo of the site.